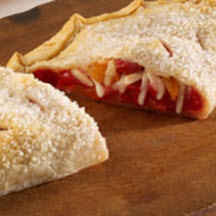 Ready-to-use refrigerated pie crust makes preparation of these fruit and cheese-filled dessert empanadas a snap to make. Toast almonds 6 to 8 minutes on cookie sheet in oven until lightly golden. Unfold both pie crusts on baking sheet. In a bowl, combine toasted almonds, cherries, apricots, almond flavoring, cinnamon, brown sugar and cheese; mix well. Spoon half of mixture onto half of one pie crust round, within 1-inch of edge, leaving other half of pastry round uncovered. Fold pastry over filling; crimping edges to seal. Finished empanada should resemble a half-circle. Repeat with remaining crust and filling. In a small bowl, combine egg and milk. Brush empañadas with egg mixture and sprinkle with sugar. Cut four small slits in top of each empanada. Bake 20 to 25 minutes or until pastry is golden brown.